Michelangelo Merisi da Caravaggio was probably the most revolutionary artist of his time, for he abandoned the rules that had guided a century of artists who had idealized both the human and religious experience. He can be said almost single-handedly to have created the Baroque style. 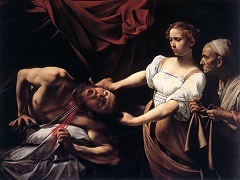 Caravaggio was born in Milan, and his father worked as an architect for the Marchese of Caravaggio; his mother Lucia, was from a family in the same district. In 1576, to escape a plague in Milan, the family moved to Caravaggio; here his father died in 1577 and his mother in 1584. In 1584, he was apprenticed, for four years to Lombard painter, Simone Peterzano; upon the apprenticeship ending, he remained in the area. Here he became familiar with works of Leonardo da Vinci, Michelangelo, Titian, Raphael and other High Renaissance masters , which were popular in the area. 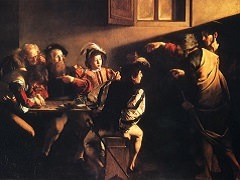 In 1592, Caravaggio fled Milan, and moved to Rome; he arrived with very little, and did not have money upon his arrival to the city. A few months after the move, he began working for Giuseppe Cesari, where he did work painting flowers and fruit in his factory. He painted several pieces during this period, and his work ended with Cesari, because of a piece he painted, while suffering from a serious illness. In these works, he depicted signs of realism, which he would focus on during his career. Following the end of his working career with Cesari, in 1954 Caravaggio was determined to make his own way and make a name for himself. With very little money, it was during this period that he made several friendships with Prospero Orsi, Onorhio Longhi, and Mario Minniti, all who worked in the art world. 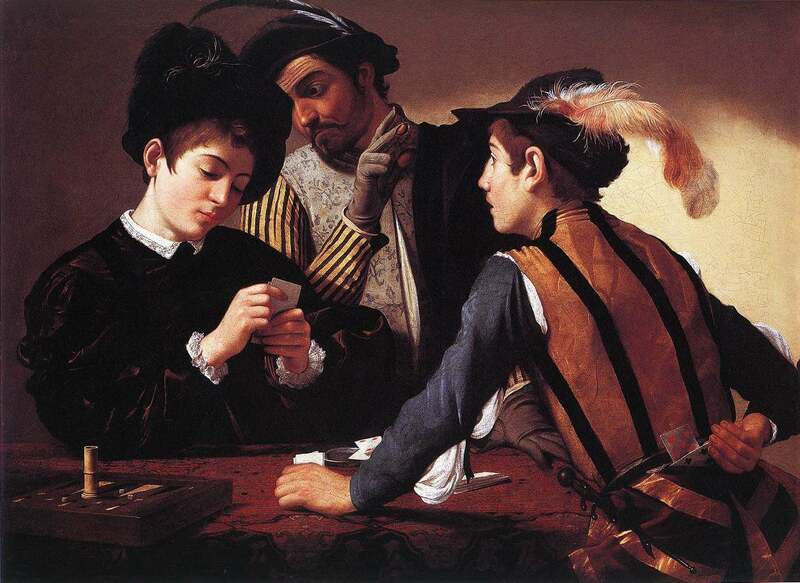 These men not only introduced Caravaggio to others in the art world, but also helped him put his work out in front of others, to gain more notoriety in this field. The Fortune Teller was his first major piece; it showed Mario being cheated on by a gypsy girl. This was a new style to Roman artists, and for this reason, the style helped pave the way for changes that came in Roman art for several years to come. However, this was sold for a very low price; his first major piece, was The Cardsharps, which is considered his first masterpiece. It became an extremely popular piece, and today, there are over 50 of these pieces in circulation. These, and several other pieces he created during this period, helped pave the way for his career, and helped create a name for him in the art world, as he began to forge friendships and meet more local artists, who were highly regarded in Roman art forms. With the first painting he did, which depicted religious themes, Caravaggio returned to a realism style of painting; During this period, he created a number of paintings with religious under tones; the first being that of Penitent Mary Magdalene. In these, and in the future work he created, the realism or naturalism, which he became most well known and famous for, were extremely prominent in the pieces that were created during this period of time. 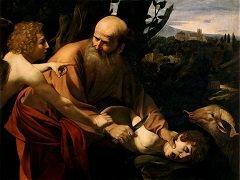 Not only were his realist pieces a shift from the natural in this region, but the lack of preparation in style, and the Venetian practice of working in oils, were some of the aspects that gave his pieces character, and that ever popular style for which Caravaggio is most known for. 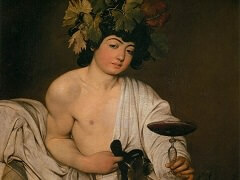 From about 1600 to 1606, Caravaggio was quite possibly known as the most famous painter in Rome. He was contracted for many works, including to to the work in the Contarelli Chapel, which was in the Church of San Luigi dei Francesi. Although most of his critics noted him as a great artistic visionary of the time, many believed he was not reliable, and the constant change in style, created opposition for many of his works. Following this commission he received at the chapel, he was also later given several contracts to do work throughout several chapels in Rome, as well as in neighboring cities. 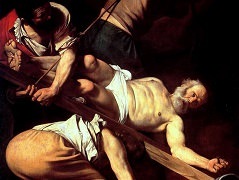 For the most part, these new paintings, and each new job he took, helped to increase the fame which Caravaggio was experiencing during the time; however, there were a few of his pieces that were rejected for the foreign style, and the distinct style which was not well appreciated by all in the art world during this period. To some, the dramatic intensity in the work he created, seemed quite vulgar, and was well beyond what was acceptable during his time. Many of his paintings dealt with death, as well as sexual depictions, which the church would not stand for; for this reason, many of the pieces that he created during this period, were viewed as vulgar. Some of the works he is most well known for during this period include: The Madonna of the Grooms, and the Death of the Virgin, which was commissioned in 1601. Although many rejected his work, the theme and styles he chose to work with, meant his work was also visionary for the time, as no other artists were willing to complete similar depictions. Painters' lives seldom generate glamour, scandal or romance on anything like the same scale as literary biography. Van Gogh was one exception. Picasso was another. Caravaggio is a third. 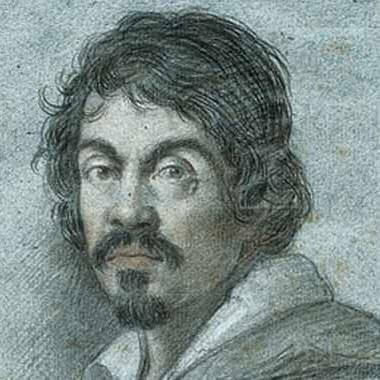 Caravaggio led an extremely notorious life; he was well known for constantly brawling and getting into arguments, not only with peers in the art world, but also with police and other authorities. He had an extensive trial record, and an extensive police record, due to the disorderly conduct, and the manner in which he conducted himself when in public. 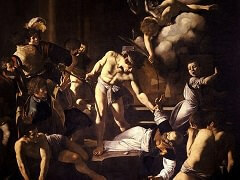 In 1606 he killed Ranuccio Tomassoni; for this, he was outlawed from Rome, and he made his way to live in Naples. Here he was protected by the Colonna family; once the most famous painter in Rome, Caravaggio was now the most famous painter in Naples. The connection he had with the Colonna family, allowed him to get hired for a series of commission works, that were to be done throughout a series of churches in Naples. In 1608 he was again arrested, for a brawl, and was exiled to Sicily. After a few more moves, and the return to Naples, after living in Sicily for nine months, Caravaggio passed away in 1910, and was still best known as being the most famous painter during his time.